“Brothers II Men, Forever” comically portrays the experience of a woman who is unsatisfied by women’s place in society. “Alexa, play ‘Despacito’” may be the common words of a popular meme, but for an actress in the Redeye Theatre Project, the quote caused a roar of laughter from a packed audience at the Richard E. Rauh Studio Theatre Saturday. The Redeye Theatre Project kicked off the newest season of its 24-hour theater festival with the first Redeye show of the year on Friday and Saturday. This theater club has produced it’s signature 24-hour theater competitions for the past 14 years, bringing student directors, actors, stagehands and more together four times a year to assemble plays in the span of a day. Show 14.1 — the first show of the 14th season — ran in the Studio Theatre in the Cathedral of Learning Saturday night. The skit involving Amazon’s Alexa was a favorite for the packed audience, amongst five other short plays. Other performances included stories lightheartedly satirizing Chancellor Gallagher, televangelist turnips and discourse on the absurdity of boy bands. These plays were the babies of six writing duos and trios that formed Friday at 8 p.m. The creative crews were given the rest of the night to devise an original short play centered on the weekend’s chosen theme — “Redeye-touille.” By 8 a.m. the next morning, actors, directors and stage crew were already preparing for the performances that would run that Saturday evening at 8. “The point is the audience is going to have fun, you know not everything has to be perfect, they don’t know what your script is,” Rice said. Undeclared first-year Emily Rothermel enjoyed this absurdity while starring in a short play titled “Jeff Bezos IX Presents: Turtlemania Xtreme.” Set in 2450, the work featured futuristic turtle races between tech giants such as Skype and Amazon and characters such as Amazon CEO Jeff Bezos’ descendant, frat boy Jeff Bezos IX. Having such dynamic and unusual shows is a key pillar to Redeye’s theater festivals. “It makes this fun for me because I love theater and what I love about theater is that it’s not something that sits dead in a drawer. It’s something that’s alive and changes with everything that you do,” Rothermel said. Pitt students perform “Turnip for What,” a play about a turnip that comes to life and complains about GMOs, as part of Pitt’s Redeye Theatre Project. 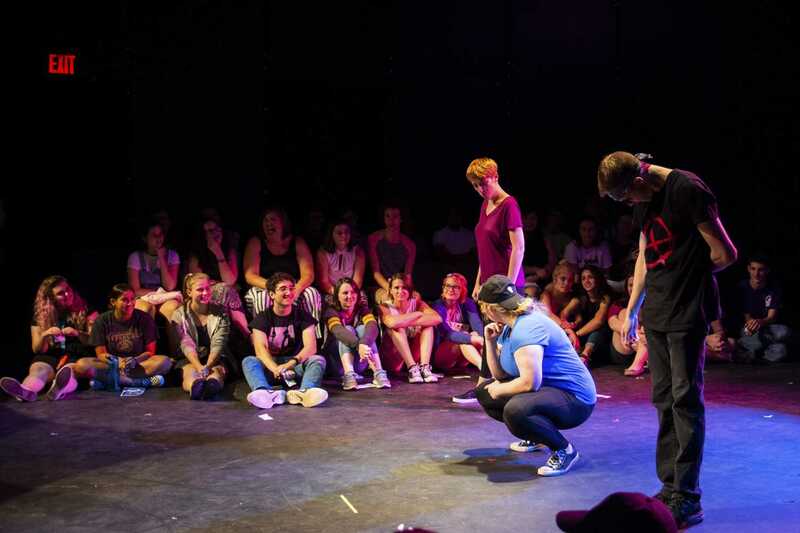 Although most major plays and musicals undergo weeks of rehearsals and multiple shows, Redeye takes a creative twist on this traditional approach. The Redeye Theatre Project shortens this time into a quick 24 hours, leaving the door open to chance and last-minute changes. This aspect of theater is heightened in Redeye festivals and is what makes new participants like Rothermel excited to come back for more shows. “[The audience members] don’t know what’s supposed to happen … there [are] going to be problems and you’re just gonna have to have fun with it and run with it,” said Rothermel. The unpredictable facet of the competition is also something that board members such as Katrina Dagenais, the marketing director and a senior English literature major, take pride in. “I mean, so many crazy things have happened in Redeye shows. Like, you’ll get like someone who fell in love with a snail man who used to be the mailman!” said Dagenais. However, one of the other aspects members like Dagenais enjoy about Redeye is that their shows don’t come with a large time commitment. With only 24 hours to write, direct and perform a play, most participants only look at spending one weekend every month or so with Redeye. “That appeals to a lot of people who might not have the time. We get people from all majors doing Redeye because all you have to do is commit [for] a weekend,” said Dagenais. Even newer members like Rothermel hope to continue with Redeye while also pursuing another field of study besides theater. Rice agrees that Redeye festivals help to pull together people from all backgrounds with differing levels of experience in theater. “People mostly have a high school background in theater, but like they could’ve even have just seen one production and thought that college theater was the time to get involved,” Rice said. Ultimately, the group hopes that the audience feels engaged in a hilarious and spontaneous amalgamation of shows. With the opportunity to take a simple theme and run with it, the shows are quick, but still captivating and curious. “You just kind of come up with something wild, new and different. It’s an original piece of theater,” said Dagenais.